Everyone knows Sushila Nada. Not just in Nada, her village in Udupi district, but also in all three districts in Karnataka and Kerala where the Koraga Federation works. It is not just because she happened to hold the position of Federation president for one year, but also because Sushila is a fearless advocate of the Koraga cause, willing to walk the extra mile to help anyone in distress. 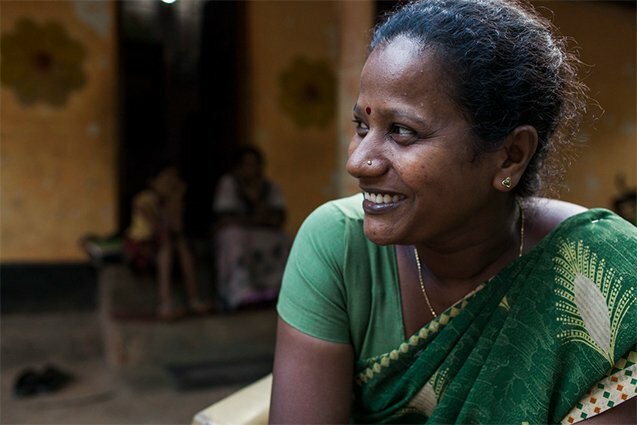 Raising her voice against injustice is not new for the 33 year-old Sushila. Drawn to the Federation’s struggle for the rights of the Koragas since her school days, Sushila was an active volunteer in their awareness campaign. However, she was unable to join the movement full time having to drop out of school after Class 10 for family reasons and opt to work as an anganwadi worker. But even that could not keep her down when she noticed a complete absence of Koraga children in the anganwadi. It took several door-to-door visits to motivate families to send their children to avail the benefits of the anganwadi. “It was not easy to convince them to claim their rights. Besides being ignorant of their rights, many were afraid their children would not be allowed to enter the anganwadi. It took time for them to understand the anganwadi was for all children and nobody could stop their entry. They started coming in ones and twos. Finally, now of the 25 children registered in the anganwadi, 10 are from the Koraga community,” said Sushila with pride. One lesson that Sushila has never forgotten from her days in a missionary school is that discrimination on the basis of colour, caste and community must never be accepted. Not surprisingly, Sushila protested vociferously on an occasion when she was stopped from drawing water from the common well near the anganwadi just because she was a Koraga. “A woman, whose child comes to my anganwadi asked me not to draw water from the well. I told her it was a common well meant for the residents and I had every right to use it. At first she argued with me and when she realized that I wasn’t going to give in, she allowed me to use it. Since then, other Koraga women also draw water from this well,” said Sushila. In 2010, when elections to the local poanchayat were announced, Sushila decided to jump into the fray. Pitted against her was another anganwadi worker backed by the local political party. Seeing her popularity, supporters of her rival threatened her with dire consequences if she did not withdraw her candidature. But the feisty Sushila refused. Unfortunately, she lost. “It was frustrating because I knew I had the community support. But I could not counter the money and muscle power. This was my first experience. I hope it will be different the next time,” she said. The inability of most women in the community to be assertive and exercise their franchise or participate in governance was another reason for their oppression and the dominance of money and muscle power, contended Sushila. This is why when she was elected president of the Federation in 2011 she tried to bring more women in leadership roles. “Women are less articulate. I encouraged them to participate in cultural programmes so that they could become confident of performing in front of crowds. The subjects chosen were related to gender equality, caste discrimination and land and food rights. This also helped to raise awareness on these issues and increase their knowledge,” she pointed out. As Federation president, she also drew attention to the plight of the community when distribution of land to Koragas under the Scheduled Tribes and Other Traditional Forest Dwellers (Recognition of Forest Rights) Act, 2006 and Land Reforms Act had come to a standstill. She led a month long march from Shimoga to Bangalore with 1000 protestors demanding their right to land be restored. The march garnered a lot of media attention and led to government authorities restarting the process of allocation of land for the community. Her feat in completing post graduation in sociology through the open school in 2013 even while pursuing her job as an anganwadi worker has been inspirational for the community. Four women in her village who had dropped out of school were motivated to follow her example. Although she continues to participate in various activities organized by the Federation as president of the Koraga Abhivruddhi Sangh of Kundapur, Sushila wants to work to empower women to claim their rights. She is concerned that the traditional matrilineal values of the Koragas are being eroded by patriarchal views, girls are still being married young and dropping out of school and, violence against women is on the rise. Sushila has organized foot marches on events like Women’s Day and the International Day for the Elimination of Violence against Women to senstize the community. “Women should be respected. Marriage should not be seen as the only goal for them. They should be given equal opportunities to achieve their dreams. Then, they can become agents of change,” she said.